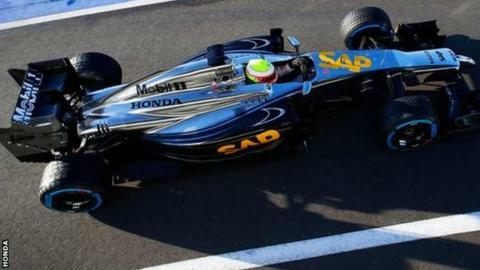 McLaren have run new partner Honda's turbo hybrid engine for the first time at Silverstone. The team, who are starting a 10-year works partnership with the Japanese manufacturer in 2015, have built an interim car to test the engine. The car had a "shakedown" test run on a "filming day", which allows 60 miles of running within the rules restricting testing. McLaren test driver Oliver Turvey was at the wheel on Friday. The MP4-29H/1X1 car stopped on track once, but the team managed to get it going again immediately. McLaren said the car was not run at racing speed, so they were unable to glean accurate first impressions of the engine, but said there was "a lot of positivity". The team plan to ship the car to Abu Dhabi so it can take part in the two-day test immediately after the season-closing race next weekend. Sources say McLaren have finalised the deal that will see Ferrari driver Fernando Alonso rejoin the team he left after one tumultuous season in 2007. The Spaniard was the team's number one target to lead them into their partnership with Honda, which they believe will see them return to the front in Formula 1 after two disappointing seasons. The two organisations hope they will be able to revive memories of their glory days together in the late 1980s and early 1990s when with Ayrton Senna and Alain Prost they won four consecutive drivers' and constructors' titles from 1988 to 1991. But an announcement on their driver line-up will be made only when they have decided who Alonso's team-mate will be. The team are understood to still be leaning towards retaining Kevin Magnussen rather than Jenson Button, which could be the end of his 15-year career. Honda, which quit Formula 1 at the end of 2008 after five unsuccessful years with its own team, has been tempted back into the sport by the new fuel efficiency-based regulations. Insiders say the new Honda engine is already close to producing a similar level of performance to the Mercedes turbo hybrid V6 which has dominated Formula 1 this season. But the Japanese company may need to find considerably more performance ahead of the new season if it is to be competitive, as Mercedes are said to have made significant steps forward with their power unit for 2015. Even under rules restricting development, sources say Mercedes have improved their engine enough to translate into a performance gain of about a second a lap for next season. As well as the factory Mercedes team, the German company will supply in 2015 Williams, Force India and Lotus, who have replaced McLaren as a customer.